Each $88 box contains 24 packs. Each pack contains 9 cards. 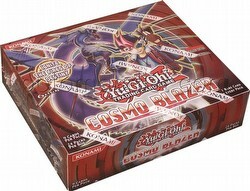 Cosmo Blazer introduces brand new fire-based themes for Yu-Gi-Oh, as well as more support cards for popular Decks. There are also cards in the set that will be a boost for the next Structure deck. Of the 100 cards in the set 48 are common, 20 are rare, 14 are super rare, 10 are ultra rare, and 8 are secret rare.